adidas Skateboarding reveals the second installment of its two-part 'LA Stories' capsule collection exclusively available at Zumiez. The Snoop x Gonz collection at Zumiez features a black, limited edition Matchcourt Mid, hoodie, long sleeve tee and t-shirt with gold accents. Signature artwork by Gonz symbolizes their shared nostalgic memories of growing up on the West Coast. 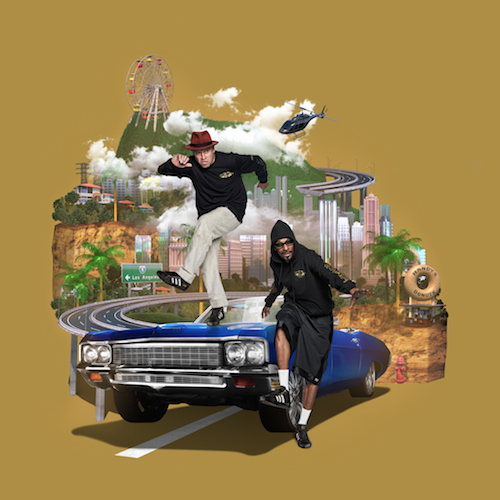 With the Zumiez release, adidas Skateboarding also drops the third and final installment of the 'LA Stories' video series starring Snoop Dogg and Gonz. The animated series, narrated by the dynamic duo, recounts stories of their shared experiences from their youth on the West Coast. In the latest video, Gonz reminisces about a random encounter with Snoop Dogg at the neighborhood convenience store as he finishes a tag on a friend's poster. 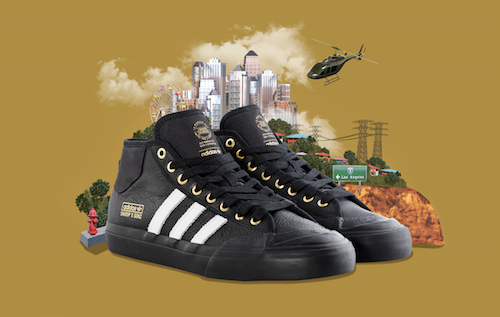 Built in collaboration with Snoop Dogg and Gonz, the limited edition Snoop x Gonz Matchcourt Mid was influenced by their joint history and connection to Los Angeles style. Designed with the iconic three stripes in a classic white hue, the shoe is built with a full-grain, black leather upper and includes a custom sockliner, canvas tongue, and gold eyelets. The shoe's outsole is embellished with Gonz's signature artwork, which also appears on the exclusive Snoop x Gonz apparel collection including hoodie, long sleeve shirt and t-shirt featuring lowriders and graffiti lettering in gold accents. The exclusive Snoop x Gonz footwear and apparel collection is available at zumiez.com starting December 3, 2016.